The Duncan Masonic Temple at 163 Canada Avenue is a landmark building in downtown Duncan. It was built in 1912 for Temple Lodge, No.33, A.F. & A.M. by the Victoria construction firm of George Charles Mesher (1860-1938), a prominent architect, builder and Freemason. The Duncan Masonic Temple was designed with space for the Freemasons’ lodge rooms on the second floor and commercial space on the street level. 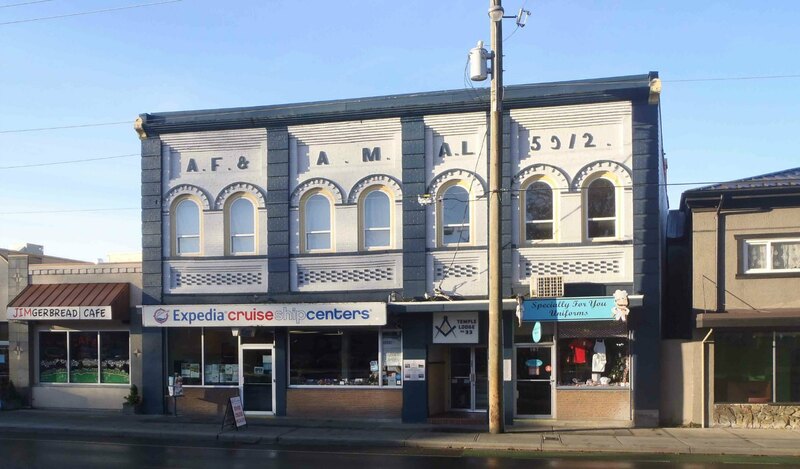 The main floor commercial space is currently occupied by two established local businesses: Expedia Cruise Ships Centers at 155 Canada Avenue and Specially For You Uniforms & Adaptive Wear at 167 Canada Avenue. At the Canada Avenue entrance to the Duncan Masonic Temple are two plaques commemorating the members of Temple Lodge, No. 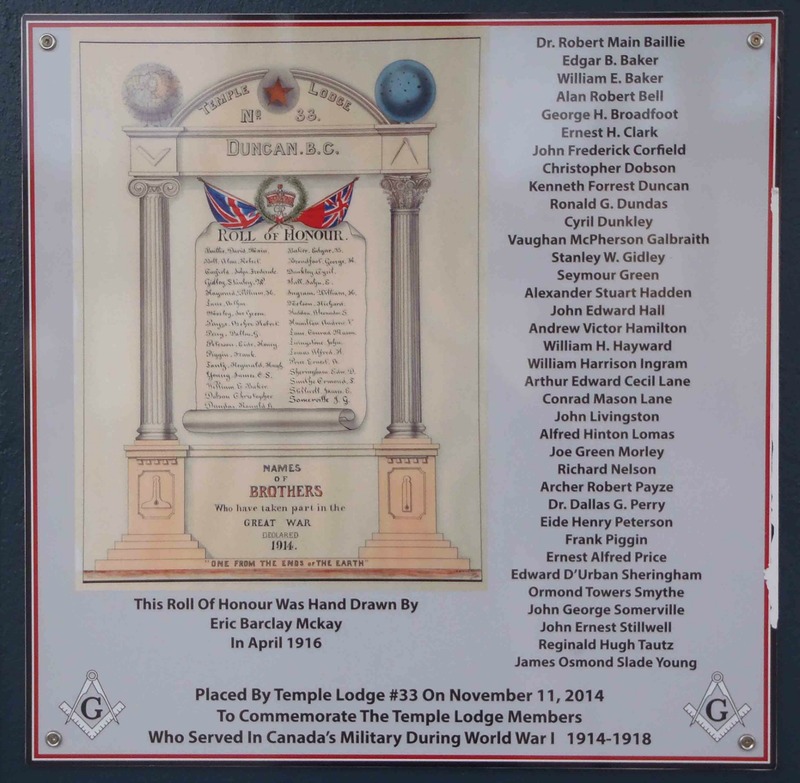 33 who served in the First World War (1914-1918) and the four members of Temple Lodge, No.33 who died in Canada’s military service during the First World War, who are also commemorated on the Duncan Cenotaph in Charles Hoey Park. According to Temple Lodge, No.33 records, the building plans for the Duncan Masonic Temple were presented to the Masonic Lodge by Lodge member Christopher Dobson in March 1912 and the building was built by George Charles Mesher’s construction firm at a cost of between $8,000 – $10,000. Unfortunately, Temple Lodge, No.33 does not currently have the original building plans for the building so it is not known whether the building plans were drawn up by Christopher Dobson or whether the building was designed by George Charles Mesher and Mesher’s plans for the building were then given to Christopher Dobson to present to his fellow members of Temple Lodge, No.33. As the Temple Lodge, No.33 website says, “while it would be very desirable to conclusively credit the design of our Duncan Masonic Temple to the extant work of Bro. George C. Mesher, we can only say with certainty that Bro. Mesher’s firm built our Duncan Masonic Temple” while Christopher Dobson presented the building plans to the members of Temple Lodge, No.33. More information about the Duncan Masonic Temple is available of the Temple Lodge, No.33 website. 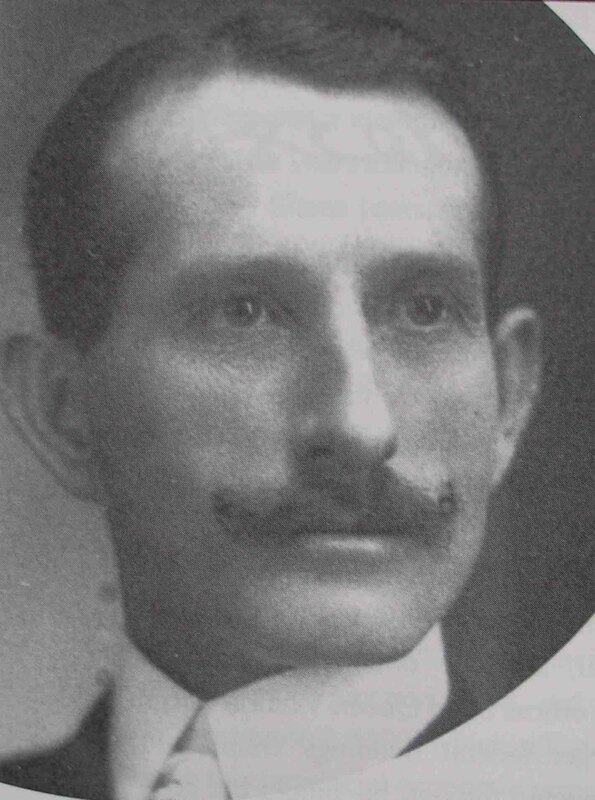 George Charles Mesher (1860-1938), architect and builder. His firm built the Duncan Masonic Temple in 1912. For those interested in more history of this building, here are the 1912 reports in the local Cowichan Leader newspaper about the opening and dedication of the Duncan Masonic Temple. The great Masonic function which was held in connection with the laying of the Foundation stone of the new Masonic temple on Saturday last, was carried through most successfully. Fortunately the day was brilliantly fine and the scene at the ceremony was one to be remembered, the bright blue and gold of the regalia of the officers of the various Lodges making a great show against the the dark clothes of the men present. Shortly after two p.m., the Duncan Band assembled outside the Cowichan Merchants Building in readiness to take their places at the head of the procession. As the procession started on its way to the scene of the ceremony the Band was in the van followed by the representatives of the Municipal Council, the City Council, the Board of Trade and the Press, after them came the members of the craft lodges and the Most Worshipful Grand Lodge. There was a large company of prominent Masons present from all over the province. Among them were: The Most Worshipful Grand Master, F.J. Burd, of Vancouver; P.G.M., W.K. Houston, of Victoria; P.G.M. H.H. Watson, M.P.P., who is also the Grand Treasurer; W. Gidley, Acting Deputy Grand Master, John M. Rudd, of Nanaimo, Grand Senior Warden; W. Henderson, of Victoria, Grand Junior Warden; C.G. Duncan and A. Campbell, of Vancouver, Acting Grand Deacons, I.W. Astley, of Vancouver, Grand Master of Ceremonies; S. Robinson, Grand Sword Bearer; E.B. McKay, Acting Grand Superintendent of Work; W.M. Dwyer, Acting Grand Marshal; J.H. Peterson, Acting Grand Secretary; A. Peterson, Acting Grand Pursuivant; E.J. Hearn and D. Stephenson, of Nanaimo, Acting Grand Stewards; A. Mitchell, Grand Tiler [sic]; and the Grand Chaplain, Rev. W.H. Fatt. The ceremony was opened with a prayer by the Grand Chaplain, and after the singing of an ode, the Deputy Grand Master, the Grand Senior and Junior Wardens tried the foundation stone with the proper instruments of Masonry, declared to the Grand Master that they found the stone to be “plumb, square and level and that the craftsmen had performed their work well.” Thereafter the proper officers scattered corn, wine and oil on the stone, symbolical of the corn of nourishment, the wine of refreshment and the oil of joy. The Grand Treasurer placed within a cavity in the stone a sealed casket containing Canadian coins of the current year, copies of the Cowichan Leader, the Daily Colonist and the Daily Times, the list of members of the Duncan Masonic Lodge, a certified list of the Mayor and Aldermen of the City of Duncan and other Masonic papers. The Grand Orator of the occasion – Mr. H.H. Watson, M.P.P. – gave a most interesting and instructive address. He referred to the very ancient origin of the Freemasons’ order, which dated from the time of King Solomon, and spoke a few words as to the objects for which the order existed. 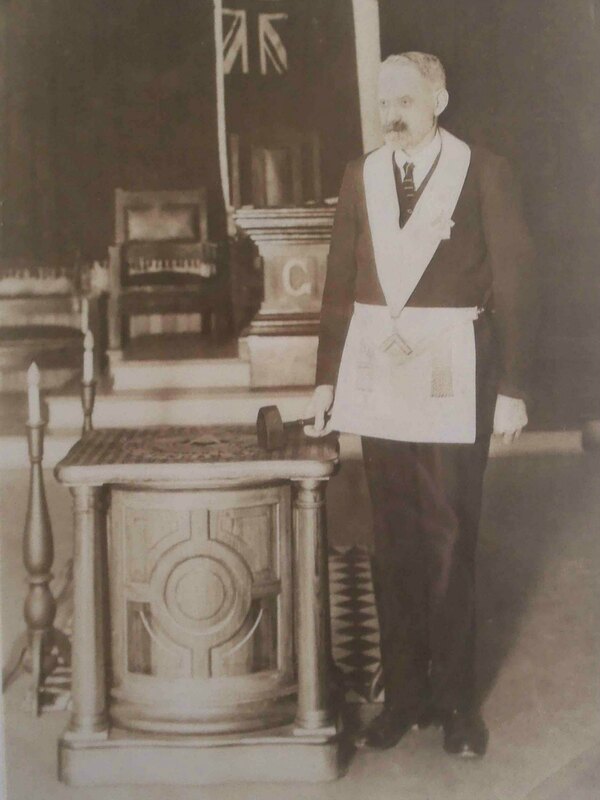 The speaker stated that Freemasonry “was a beautiful system of morality veiled in allegory and illustrated by symbol.” He said that he had been present some twelve years ago as Grand Master of B.C., when Temple Lodge had been instituted at Duncan, and he was glad to see the Lodge had prospered. The ceremony came to an end with a prayer by the Grand Chaplain, and the company with their guests adjourned to the upper storey of the new Cowichan Merchants’ Block, where tea was served by the Ladies’ Guild of St. Andrew’s Presbyterian Church. The Mayor, Mr. Kenneth Duncan, welcomed the visitors to the city, and hoped they would enjoy their visit. A large number of the visiting Masons stayed over night at Duncan, and were present during the evening when Most Worshipful Grand Master F.J. Burd paid an official visit to Temple Lodge, Number 33. The New Masonic Temple on Front Street [note: now called Canada Avenue] was formally opened and the Hall dedicated to Masonic purposes on Saturday last the 26th. The ceremony was performed by the Most Worshipful Grand Master of Masons of British Columbia, John M. Rudd, of Nanaimo, in the presence of a large number of officers and members of the Grand Lodge of British Columbia. At the conclusion of the ceremony of dedication by the Grand Lodge, the assembled brethren were guests of the brethren of Temple Lodge at a banquet which had been prepared by the Ladies Guild of St. Andrew’s. Worshipful Master W.M. Dwyer, of the local Lodge was in the chair, and welcomed the visiting brethren with a few well chosen words. Among those present at the ceremony were: Immediate P.G.M. F.J. Burd, of Vancouver; Deputy G.M. Skay, of Kamloops; P.G.M. W.K. Houston, of Victoria, and H.N. Rich, of Ladner. Others present included Judge Harrison, of Victoria, John Stewart, of Ladysmith and the Hon. Abraham Smith, United States Consul at Victoria.